St Kilda is an inner suburb (neighbourhood) of the metropolitan area of Melbourne, Victoria, Australia, 6 km south-east of Melbourne's Central Business District. Kick off your visit on the 5th (Sun): examine the collection at Scienceworks, then stroll through St. Kilda Beach, and then take in nature's colorful creations at Veg Out Community Gardens St Kilda. 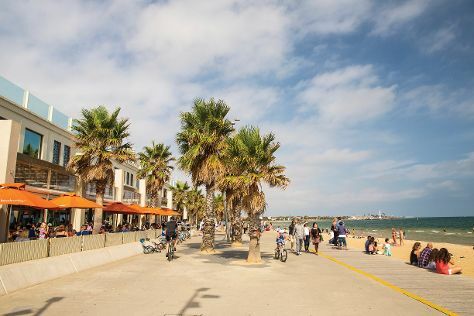 Get ready for a full day of sightseeing on the next day: take an in-depth tour of Jewish Holocaust Centre and then kick back and relax at Brighton Beach. For other places to visit, maps, ratings, and other tourist information, use the St Kilda sightseeing planning site . Singapore, Singapore to St Kilda is an approximately 11-hour flight. You can also do a combination of flight and shuttle. You'll lose 2 hours traveling from Singapore to St Kilda due to the time zone difference. Prepare for cooler weather when traveling from Singapore in May: high temperatures in St Kilda hover around 20°C and lows are around 10°C. Wrap up your sightseeing by early afternoon on the 6th (Mon) to allow enough time to travel back home.